Glenn Sterner, Assistant Professor of Criminal Justice at Penn State Abington and recent Criminal Justice Center Postdoctoral Scholar Alumni received the Penn State Community Engagement and Scholarship Award. Dr. Sterner received this award for the Share Your Opioid Story initiative which works to address stigma in partnership with the Independence Blue Cross Foundation and The Department of Drug and Alcohol Programs. The Penn State Community Engagement and Scholarship Award recognizes an outstanding engaged scholarship initiative that best exemplifies Penn State’s commitment to the ideal of an engaged institution-an institution that has redesigned its learning, discovery, and engagement functions to become even more involved with its communities through reciprocity and mutual respect among partners. This award is endorsed by the Provost and supported by the University Council on Engaged Scholarship and the Faculty Senate Committee on Outreach. Dr. Sterner received this award on April 2, at the Faculty/Staff Awards Recognition ceremony at the Nittany Lion Inn. Upon receiving this award, The Share Your Opioid Story outreach project is entered into a pool of national outreach projects to be considered for further recognition. Season 3 of the Serial podcast tells the story of the Cleveland courthouse and the people working in its courtrooms, back hallways, judges’ chambers, and prosecutors’ offices. 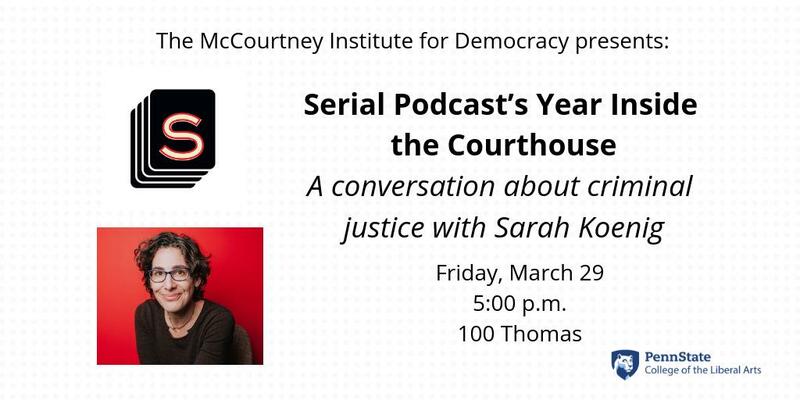 McCourtney Institute for Democracy Director Michael Berkman will talk with Koenig about what she learned while making the podcast. The Criminal Justice Research Center and The Rock Ethics Institute are co-sponsoring the event. On March 20, 2019 at 7:00 p.m. in the Eisenhower Auditorium, Bryan Stevenson will be presenting for the Rock Ethics Institute 2019 Richard B. Lippin Lecture. Stevenson is the founder of the Equal Justice Initiative (EJI) and author of the New York Times bestseller Just Mercy. Under Stevenson's leadership, the EJI has won significant legal challenges eliminating excessive and unfair sentencing, exonerating innocent death row prisoners, confronting the abuse of the incarcerated and the mentally ill, and aiding children prosecuted as adults. The EJI recently opened a national memorial to victims of lynching, as well as a companion museum on the site of a former slave warehouse in Montgomery, Alabama. Stevenson's lecture will explore what justice demands, both inside and outside the courtroom, and the need to address the legacy of racial violence and oppression in the United States. A book signing will follow the lecture. The event will be free and open to the public. Tickets will become available in the spring semester. Please join us for the upcoming Criminology Forum on October 23, 4:00- 5:00 p.m. in 302 Pond Lab. Dr. Jeffery Ulmer, Professor of Sociology and Criminology Penn State, Associate Department Head and Dr. Gary Zajac, Managing Director Criminal Justice Research Center, Penn State, will be presenting "“Murder Case Processing and the Death Penalty in PA: 2000-2010.” The death penalty and murder sentencing are the most consequential punishment decisions in U.S. society. There has been long-standing concern about disparity in these decisions, most prominently, disparity based on the race/ethnicity and gender of defendants and victims, as well as concern about differences in case outcomes related to legal representation, and differences between court jurisdictions. We examine murder case processing with a focus on decisions surrounding the death penalty in first degree murders. We collected basic statistical data on 4,274 cases charged with homicide in Pennsylvania from 2000 to 2010, and then collected highly detailed data from courts and prosecutors’ offices on a subset of 880 first degree murder convictions in 18 of Pennsylvania’s 67 counties. Utilizing propensity score weighting methods, we examined: 1) prosecutors’ decisions to seek the death penalty, 2)prosecutors’ decisions to retract a motion to seek the death penalty once it is filed, and 3) court decisions to sentence defendants to death or life without parole. We conclude by describing our extension of this research to include non-capital murders and earlier case processing decisions by prosecutors. This lecture is co-sponsored by the Criminal Justice Research Center and the Department of Sociology and Criminology. Please join us for the upcoming Criminology Forum on October 12th, 2:00- 3:00 pm in 406 Oswald Tower. Dr. Kyle Thomas will be presenting on "Decision-Making and Desistance: The Relative Importance of Changing Expectations and Changing Preferences." An Assistant Professor at the University of Missouri- St. Louis, Dr. Thomas applies a rational choice framework to the decision-making processes underpinning criminal desistance. First, he examines if subjective expectations of offending are age-graded, such that perceptions of rewards decrease, and perceptions of risks/costs increase over age. Second, he tests if the latent marginal (dis)utilities that derive from these expectations (e.g., preferences for risk, costs, and rewards) are age-graded in ways that promote declines in offending. He presents results from a study that uses a decomposition model to partition differences in offending from adolescence to young adulthood that are attributable to changing subjective expectations (E) and changing marginal utilities (β) among a subset of the Pathways to Desistance sample (N = 585). He then introduces a discrete choice random utility model to estimate between- and within-person differences in preferences and demonstrates how the model can be used to examine predictions outlined in prominent theories of desistance. This presentation will focus on the composition and purpose of the PA Board of Pardons and detail the pardoning process within the state. It will be highly relevant to criminal justice courses and students. To RSVP for the afternoon session at the HUB, contact Rebecca Reitz, MS at the Criminal Justice Research Center (814) 867-3291. The Penn State Postdoctoral Society named Glenn Sterner, Ph.D., the 2018 Outstanding Postdoc recipient. Dr. Sterner was a postdoctoral scholar at the Criminal Justice Center for Research and is currently an Assistant Professor of Criminal Justice at Penn State Abington. The award ceremony will take place on September 28 at 3:45 p.m. in the HUB, Room 129 AB. Additional information. The Prison Inmate Networks Study (PINS) research team recently published an article in the Journal of Health and Social Behavior on “Social Networks and Health in a Prison Unit.” The article discusses health characteristics and peer relationships of justice-involved individuals. The authors include: Dana Haynie (The Ohio State University), Corey Whichard (The State University of New York, Albany, The Pennsylvania State University, Justice Center for Research Graduate Student Assistant Alumni), Derek Kreager (The Pennsylvania State University, Justice Center for Research Director), David Schaefer (University of California, Irvine), and Sara Wakefield (Rutgers University). View the article and one-page policy brief. The Criminal Justice Research Center (CJRC) and Department of Sociology and Criminology at The Pennsylvania State University invite applications for a Postdoctoral Scholar position to begin June 1, 2019, or as soon as practical thereafter. The successful applicant will collaborate with the Pennsylvania Commission on Sentencing on research related to sentencing guidelines, risk and needs assessment (development and validation of tools), pre-trial release, parole, program evaluation, and related topics. Applications are encouraged from both current Ph.D. candidates (an appointment to the position is contingent on completing all requirements for the degree by the appointment date) and scholars who have completed the Ph.D. within the past two years. A Ph.D. in criminal justice, criminology, sociology, economics, public policy, or a related field is required. Preference will be given to candidates with advanced training in statistics or methods of causal inference and to those with research interests in courts or sentencing and with a knowledge of, or practical experience with, program evaluation. Responsibilities may include data collection and/or management; data analyses; preparation of grant proposals, manuscripts, and conference presentations; and participation in graduate student mentoring. In addition to collaborative projects, the scholar will have access to exceptional resources to facilitate his or her independent research. The CJRC has an outstanding portfolio of faculty affiliates, seed funding resources, and externally funded ongoing research projects. The Department of Sociology and Criminology is ranked among the top in the nation and provides graduate and undergraduate programs focused specifically on crime and the criminal justice system. The initial appointment will be for two years, with the potential for a third year contingent on the candidate’s productivity and the availability of funding. Interested candidates must submit an online application and should include a letter of interest and CV. If selected as a finalist for the position, recommendation letters will be requested. Review of applications will begin October 15. For more information about the position, please contact Professor Derek Kreager (dak27@psu.edu). The Rock Ethics Institute would like to invite you to its upcoming conference, "Ethics of Policing," which will take place September 20-22 at the Penn State - University Park campus. The conference will feature leading scholars on policing from a variety of fields, including African American studies, criminology, law, philosophy, political science, and sociology. This internship provides students the opportunity to work with prison staff as part of the Re-Entry Services Office (RSO) at State Correctional Institutions Rockview and Benner, both located in Bellefonte, PA. The RSO prepares offenders for community reintegration. The program strives to enhance public safety and to assure good outcomes for offenders during the reintegration process. Full announcement here. RHS 428: Rehabilitation in Corrections will provide an overview of the philosophical and practical aspects of rehabilitation within correctional settings designed to maintain public safety. The history of correctional treatment, recent developments in classification and risk assessment, intervention strategies for offenders with diverse treatment needs, and current approaches to rehabilitation will be presented. An emphasis will be placed on the impact of the correctional milieu on achieving an individual’s rehabilitative goals within the context of the correctional professional and offender relationship. Listen to Dr. Glenn Sterner talk about the Share Your Opioid Story project on the latest Scroll Down: True Philadelphia Stories podcast "Because That's What Families Do," on Grandfamilies. In 2011, the Pennsylvania State Senate passed Resolution #6, which called for a portfolio of research on 17 topics related to the death penalty in Pennsylvania. The Justice Center for Research was named as a research advisor to this effort, with the PA Joint State Government Commission (JSGC) serving as overall project manager. Center members, including Center Managing Director Gary Zajac, Center Director Derek Kreager, and Center affiliates John Kramer and Jeff Ulmer, contributed research to several of the topics, including collateral consequences of death sentencing, public opinion, mental health, and disparity in sentencing. The JSGC has just released the final overall report for the SR6 project. Read the final report. Dr. Glenn Sterner, Justice Center Postdoctoral Scholar, was recently interviewed by Comcast Newsmakers about his research on the opioid crisis. In the interview Glenn discusses Justice Center for Research projects, including Identifying and Informing Strategies for Disrupting Drug Distribution Networks: An Application of Community Policing to Opiate Flows in Pennsylvania, Share Your Opioid Story: A Collaboration between Independence Blue Cross Foundation, The Department of Drug and Alcohol Programs, and Penn State University, and Understanding the Individual and Social Network Characteristics of Opiate Users in Rural Pennsylvania with Host Sheila Hyland. Dr. Glenn Sterner discusses the ways to counter the stigma surrounding opioid addiction in new blog post. The blog details the Share Your Opioid Story Project which highlights the stories of those impacted by the opioid crisis. The Share Your Opioid Story project is a collaboration between Independent Blue Cross Foundation, The Department of Drug and Alcohol Programs, and Penn State University. Led by Justice Center Postdoctoral Scholar, Dr. Glenn Sterner, the Share Your Opioid Story website depicts the stories of individuals impacted by the opioid crisis. A new Justice Center project, Examining Murder Convictions and Punishment recently received a $300,000 award from the National Science Foundation. The project will be led by Jeffery Ulmer (Justice Center Faculty Affiliate), Gary Zajac (Justice Center Managing Director), and John Kramer (Justice Center Faculty Affiliate). This study will examine the decisional processes employed in capital case prosecution and sentencing, as well as build upon the analysis previously conducted under the death penalty study recently completed by Drs. Kramer, Ulmer and Zajac. The article “Outcome Findings from the HOPE Demonstration Field Experiment,” published in Criminology & Public Policy was one of the journal’s top 20 most downloaded recent papers, within the first 12 months of online publication. Honest Opportunity Probation with Enforcement (HOPE) is a probation program that involves swift, certain, and consistent sanctions. The team of researchers at the Justice Center for Research in collaboration with RTI, International tested the HOPE probation model in 4 sites across the country looking at the implementation of the program as well as recidivism outcomes. Justice Center Managing Director, Dr. Gary Zajac led the process evaluation component of the HOPE DFE along with Researcher Elaine Arsenault, and Justice Center Founding Director Dr. Doris Layton MacKenzie was a Co-PI on the outcome evaluation phase with RTI. Tom Loughran, Ph.D., Professor of Sociology and Criminology will be the next Criminology Forum speaker. Dr. Thomas Loughran’s research primarily focuses offender decision-making, individuals’ responses to criminal sanctions in terms of multiple outcomes, and methods to infer treatment effects from nonexperimental data. His talk will focus on the ways in which adolescents’ behaviors early in childhood (e.g., physical aggression) inform targeted prevention programming related to adolescent substance use and delinquency. He will present data from the Rochester Intergenerational Study (RIGS), which contains prospective, longitudinal measures of 529 children from early childhood into adolescence. Additionally, he will demonstrate how group-based trajectory modeling enables the evaluation of the predictive capability of childhood internalizing and externalizing behaviors for adolescent substance use, which may be used as a potential basis for targeted early interventions. Justice Center for Research Postdoctoral Scholar, Glenn Sterner, Ph.D. was named one of Independence Blue Cross’s Future Leaders in Community Health for Philadelphia. Read the article on Glenn’s work in the current Journal of Change issue. Congratulations Glenn! Justice Center Postdoctoral Scholar, Glenn Sterner, Ph.D., will be presenting on the Share Your Story project at the Together We Can Convention on 4/28. Justice Center Postdoctoral Scholar Glenn Sterner’s work on the Share Your Opioid Story project in collaboration with the Independence Blue Cross Foundation is being honored by the 2018 Philadelphia Business Journal Faces of Philanthropy Awards. Congratulations Glenn! Glenn Sterner, Ph.D. presents "A Comprehensive Criminological Research Agenda to Address the Opioid Crisis" at Research Unplugged in Schlow Library. The event will take place on Thursday April 12th from 12:30-1:30pm in the Downsbrough Community Room. Dr. Sterner’s talk examines three active Justice Center projects that target specific populations associated with the opioid crisis: current opioid users, illegal distributors of opioids, and those who stigmatize opioid addiction. “A Life Course and Networks Approach to Prison Therapeutic Communities” was published in the edited volume, Social Networks and the Life Course: Integrating the Development of Human Lives and Social Relational Networks. The chapter discusses the work from the Therapeutic Community Prison Inmate Networks Study (TC-PINS), and ”applies life course and social network perspectives to understand prison TC processes and demonstrate the feasibility and promise of our approach with preliminary findings from a cross-sectional study of a small TC (N = 20) in a maximum-security men’s prison.” Authors include: Derek Kreager, Justice Center Director, Martin Bouchard, Professor at Simon Fraser School of Criminology, George De Leon, Clinical Professor of Psychiatry at NYU School of Medicine, David Schaefer, Associate Professor at UC Irvine Sociology, Michaela Soyer, Justice Center Postdoctoral Scholar Alumni, now at Hunter College, Jacob Young, Associate Professor at ASU School of Criminology & Criminal Justice, and Gary Zajac, Justice Center for Research Managing Director. Have you lost a loved one or a friend to an opioid overdose? Are you in recovery from opioid addiction? Are you currently struggling with opioid addiction? Are you a grandparent raising a grandchild because your child is battling opioid addiction? Or maybe you have been affected by the opioid epidemic in some other way. The Center invites applications for a postdoctoral scholar position to begin June 1, 2018 or as soon as practical thereafter. The JCR supports innovative criminal justice research focused on the connections between research, policy, and practice. The successful applicant will collaborate with Dr. Eric Baumer in the Department of Sociology and Criminology on research that focuses on the spatial and temporal dynamics of crime and victimization. Applications are encouraged from both current Ph.D. candidates (an appointment to the position is contingent on completing all requirements for the degree by the appointment date) and scholars who have completed the Ph.D. within the past two years. A Ph.D. in sociology, criminology, economics, public policy, or a related field is required. Preference will be given to candidates with advanced training in statistics or methods of causal inference and to those with research interests in communities and crime and/or crime trends. Responsibilities may include data collection and/or management; data analyses; preparation of grant proposals, manuscripts, and conference presentations; and participation in graduate student mentoring. In addition to collaborative projects, the scholar will have access to exceptional resources to facilitate his or her independent research. The JCR has an outstanding repertoire of faculty affiliates, seed funding resources, and externally funded ongoing research projects. The initial appointment will be for one year, with the potential for a second year contingent on the candidate’s productivity and the availability of funding. Salary range for this position is $50,000 to $60,000. To apply and be considered for this opportunity, please submit a letter of interest and CV here. If selected as a finalist for the position, recommendation letters will be requested. Review of applications will begin immediately and continue until the position is filled. For more information about the position, please contact Professor Baumer (epbaumer@psu.edu). Justice Center for Research Postdoctoral Scholar, Glenn Sterner’s work on the opioid crisis was recently featured in the Penn State News. In the article, Dr. Sterner discusses two new projects: Share Your Opioid Story: A Collaboration between Independence Clue Cross Foundation, The Department of Drug and Alcohol Programs, and Penn State University and Identifying and Informing Strategies for Disrupting Drug Distribution Networks: An Application of Community Policing to Opiate Flows in Pennsylvania which is supported by the National Institute of Justice. Dr. Derek Kreager, Center Director, is seeking two undergraduate research assistants to help support the Reentry Prison Inmate Study. More information can be found here. A recent article in The Daily Collegian features an interview with Justice Center Postdoctoral Scholar, Glenn Sterner, Ph.D., and Peter Forster, Associate Dean, College of Information Sciences and Technology, on their work on the opioid crisis. The Identifying and Informing Strategies for Disrupting Drug Distribution Networks project was recently awarded nearly a $1 million grant by the National Institute of Justice. The project team consists of Principal Investigators: Glenn Sterner, Ph.D., Ashton Verdery, Department of Sociology and Criminology, Shannon Monnat, Associate Professor, Sociology, Maxwell School of Citizenship and Public Affairs, Syracuse University, Co-Investigators: Peter Forster, Associate Dean, College of Information Sciences and Technology, Gary Zajac, Managing Director, Justice Center for Research, and Scott Yabiku, Department of Sociology and Criminology. Read the full article here. An article titled, “Measuring the Criminal Mind: The Relationship Between Intelligence and CSS-M Results Among a Sample of Pennsylvania Prison Inmates” looks at the relationship between the measurement of IQ and criminal thinking. The article is featured in Criminal Justice and Behavior. The authors Michaela Soyer and Susan McNeeley are Justice Center Postdoctoral Scholar Alumni, now at Hunter College and Minnesota Department of Corrections, respectively, Gary Zajac is the Managing Director of the Justice Center for Research, and Bret Bucklen is the PADOC Research Director. Please join us for our first Criminology Forum of the semester. Rhys Hester, Ph.D., Deputy Director, Pennsylvania Commission on Sentencing and Senior Lecturer of Sociology and Criminology at Penn State, University Park, and Derek Kreager, Ph.D., Director, Justice Center for Research and Professor of Sociology and Criminology at Penn State, University Park, will be our guest speakers for the next Criminology Forum. Dr. Rhys Hester is the Deputy Director of the Pennsylvania Commission on Sentencing and Senior Lecturer in the Department of Sociology and Criminology at Penn State. He holds a PhD in Criminology and Criminal Justice as well as a JD. Prior to his current position at the Commission, Dr. Hester was a Research Fellow in Sentencing Law and Policy at the Robina Institute, University of Minnesota Law School. He teaches courses related to courts, constitutional law, and criminal law and procedure. His research has been published in academic journals and law reviews including Criminology, Journal of Quantitative Criminology, and (forthcoming) Crime and Justice: A Review of Research. Dr. Derek Kreager is Director of the Justice Center for Research, Professor of Criminology, Sociology, and Demography, co-funded faculty member of the Social Science Research Institute (SSRI), and an associate of the Population Research Institute (PRI). He received his M.A. and PhD from the University of Washington and his B.S. from the United States Military Academy. He has been a faculty member at PSU since 2006. His research lies at the intersection of social networks, crime, and the life course. Most recently, he has led the portfolio of Prison Inmate Networks Studies (PINS) focused on the social networks, health and re-entry experiences of male and female inmates in PA state prisons. This work has been supported by grants from NSF, NIH, and NIJ, funded four PSU graduate students, and resulted in papers published in ASR, Social Networks, and Justice Quarterly. Justice Center for Research’s Postdoctoral Scholar Glenn Sterner spoke on September, 14th to the Federal Reserve Bank of Philadelphia on his work on the Opioid Crisis. Invited by Keith Wardrip, Community Development Research Manager, Dr. Sterner led a conversation on his work in three projects across 16 counties in the State of Pennsylvania to catalyze an exchange on how the Community Development Studies and Education Department might develop opportunities to address the opioid crisis in their service region. A Special Edition of the Journal of Change on the opioid crisis, published by the Independence Blue Cross Foundation features an article by Glenn Sterner, Ph.D., Justice Center Postdoctoral Scholar. Dr. Sterner’s article “Seeing Past Stigma: 4 Ways to Confront Bias Toward Opioid Addiction” encourages individuals to consider the stereotypes surrounding opioid addiction and offers steps to alleviate the stigma associated with addiction. Glenn Sterner, Ph.D., discusses the Opioid Crisis in the DOJ OJP Diagnostic Center blog. In the blog, Dr. Sterner highlights current work with the Pennsylvania State Police and offers suggestions for the future on how we can examine drug trends. Check out Dr. Sterner's blog piece here. Upcoming Listening Sessions on Opioid Addiction will be held in York and Franklin County from 6:00 PM to 8:00 PM on September 20th and October 5th, respectively. At the Listening Sessions, local and state officials will discuss available local and state resources for opioid addiction available for public access. We are interested in hearing the audience’s perspective on additional services needed in the community to combat the opioid crisis in their community. The Listening Sessions are a collaboration between the York County Coalition, Franklin County Overdose Drug Task Force, and The Pennsylvania Coalition for Addressing Heroin and Opioid Addiction (PaCHOA). Justice Center for Research Postdoctoral Scholar, Glenn Sterner, Ph.D., will be hosting and coordinating the event in his role as a Chair of PaCHOA. The Justice Center for Research is seeking a candidate for a Research Technologist position in the area of criminal justice research. This position will offer the opportunity for involvement in innovative research projects being conducted by The Justice Center for Research and its affiliate faculty. You can learn more about the position here. Glenn Sterner and Diana Fishbein wrote an Op Ed on the need for national leadership to fight the opioid crisis. Read the full article in The Hill here. Glenn Sterner and collaborators to develop The Consortium for Public Scholars. This colloquium is being held to develop The Consortium for Public Scholars. This colloquium is open to university professionals, community professionals, community residents, and advanced high school, undergraduate, graduate, and professional students in the Philadelphia region. Public scholarship refers to knowledge generation and transfer initiatives developed and conducted with and for the public. When engaged in such endeavors, both local and expert knowledge is appreciated and utilized to develop a more nuanced understanding of an issue for public benefit. This paradigm challenges higher education professionals to see their work for the university as embedded parts of external systems in which their skills, knowledge, and resources are insufficient without the skills, knowledge, and resources of local community members. It also requires community professionals and residents to examine their role in their communities, exploring how they can meld their expertise and experience to address public issues. Public scholarship products reflect a critical, discursive, dialogic perspective that tethers knowledge with action; encourages local results with an eye toward broader application; and requires sharing of both knowledge and process in ways that are publicly accessible in terms of language and distribution. While initiatives exist that bind together individuals who are dedicated to outreach and/or engagement, there are relatively few opportunities for all types public scholars to collaborate and share knowledge across disciplines, interest areas, and categories of work. This colloquium aims to address this concern by developing a consortium of public scholars across institutions of higher education, non-profit organizations, private businesses, and the community in the Philadelphia region. We use the term scholar broadly to include any individual interested in sharing their knowledge of their work in addressing public issues, not only those involved in academia. If this is you, we hope that you will participate. The organizing purpose of this colloquium is to share examples of best practices for public scholarship, and co-develop a path forward for the consortium. The detailed schedule for the colloquium will be updated shortly. The colloquium will take place at the Penn State Center Philadelphia, and will be October 12, 2017, 8:00 a.m.–6:00 p.m., and October 13, 2017, 8:00 a.m.–3:30 p.m. Registration is limited to 50 people, so please register before the event is full. Please consider presenting a paper at the colloquium on your public scholarship. If you are a student (advanced high school, undergraduate, and graduate or professional student) you are encouraged to participate in the Student Poster Session as well. You can find the call for abstracts here. Abstracts for papers are due September 1, 2017. Abstracts for student posters are due September 1, 2017. The 2017 College of the Liberal Arts Office Olympics were held on 8/1 on the Moore Building Lawn. The Oswald Ocelots, consisting of staff members from the Department of Sociology and Criminology: Amy Schmoeller, Renee Kennedy, and Eunice Hockenberry and Justice Center for Research team members: Laura Reddington Moser and Elaine Arsenault took home the bronze medal in the "Rubber Band Snap" challenge. Teams participated in fundraising efforts throughout the year and raised over $16,000 for the Centre County United Way. The Oswald Ocelots were the third place team in the fundraising challenge. Justice Center for Research Founding Director, Doris L. Mackenzie, was awarded the CEBCP Distinguished Achievement Award in Evidence-Based Crime Policy at George Mason University on June 26. “This award recognizes outstanding achievements and contributions by individuals in academia, practice, or the policy arena who are committed to a leadership role in advancing the use of scientific research evidence in decisions about crime and justice policies. This role includes notable efforts in connecting criminology, law and society researchers with criminal justice institutions, or advancing scientific research more generally in crime and justice. The award is conferred yearly.” Congratulations Dr. MacKenzie! Justice Center for Research Postdoctoral Scholar, Glenn Sterner presented at the International Network for Social Network Analysis (INSNA) in Beijing, China on June 3. His poster titled “Networks of Influence: Exploring Criminal Justice Campaign Finance in a Pennsylvania County.” The presentation highlighted several findings from a study that utilizes a social network approach to examine the network of campaign contributions to elected criminal justice system officials in one county in Pennsylvania (PA). The study focused on two main research questions: do donors contribute to more than one elected criminal justice official in this county in PA? and is there a network of donors contributing to elected criminal justice officials in this county in PA? "Because social science drives smart investments in public safety," writes Nancy La Vigne, Director of the Justice Policy Center at the Urban Institute and Chair of the Crime and Justice Alliance. Read her article on how findings from criminology help us answer crucial questions about crime and our justice system on the Why Social Science Blog. Derek Kreager (Justice Center for Research Faculty Affiliate), Jacob Young (ASU), Dana Haynie (OSU), Martin Bouchard (Simon Fraser University), David Schaefer (UC Irvine), and Gary Zajac (Justice Center for Research Director) recently published an article in American Sociological Review. The article titled, “Where “Old Heads” Prevail: Inmate Hierarchy in a Men’s Prison Unit” uses narrative and social network data from inmates in a Pennsylvania prison to support the proposition that older and more experienced inmates ("old heads") serve as role models on the unit, fostering a positive and stable peer environment, as has been suggested by previous prison ethnographies. "The Trump administration has signaled its crime policy intentions through a series of Executive Orders signed in the President’s first several months in office. These executive orders demonstrate an incongruity between administrative policy efforts and well-established science about the causes and consequences of crime. Four general areas are especially emblematic of this problem." Please join us Monday, April 24th in 406 Oswald Tower for the final Criminology Forum of the semester. Harrington "Bo" Cleveland, Ph.D., Associate Professor, Human Development and Family Studies Department, Penn State, University Park, and Eric J. Connolly, Ph.D., Assistant Professor, Department of Criminal Justice, Penn State, Abington, will be our guest speakers. The title of their talk is "Current Status and Future Directions for Research on Genetics and Crime," their talk will be focused around the topic of genetics and crime, including the future directions and challenges for research in this area. Harrington “Bo” Cleveland is the Co-Director of the Gene-Environment Research Initiative at Penn State. He received his J. D. from Boston College, his Ph.D. in Family Studies and Human Development from the University of Arizona, and post-doctoral training in demography at UNC-Chapel Hill. He is an Associate Editor of Journal of Research on Adolescence. His topical interests focus on person-by-context transactions affecting adolescent adjustment and substance use, with a long-term interest in gene x environment interactions and gene-environment correlations. Eric J. Connolly’s research interests include biosocial criminology, criminological theory, and developmental/life-course criminology. His research focuses on the examination of genetic and environmental influences on criminal and delinquent behaviors across the life course. Some of his recent work has appeared in journals such as Child Development, Criminology, Journal of Criminal Justice, and Journal of Quantitative Criminology. Laura Reddington Moser, Justice Center for Research Administrative Coordinator, and Elaine Arsenault, Research Assistant, participated in training on Mental Health First Aid and Suicide Prevention on March 24 at the Student Health Center at Penn State. Laura and Elaine learned strategies and solutions to assist individuals and participated in engaging activities that depicted the course content. Laura and Elaine received a certificate for the completion of the 8 hour training course. Congrats Laura and Elaine! Justice Center Postdoctoral Scholar, Glenn Sterner, Ph.D. published an article in the recent North American Colleges and Teachers of Agriculture volume. Dr. Sterner and his colleagues Alison Harrell, Theodore R. Alter, and Jean Lonie article, "Student Perceptions of the Impact of their Diverse Study Abroad Experiences," details the motivations of undergraduates to participate in studying abroad. Center Director Gary Zajac was recognized on April 12 at the College of the Liberal Arts 2017 Annual Researcher Appreciation Reception for having six consecutive years of external funding. Faculty Affiliates Wayne Osgood, Derek Kreager, Jeff Ulmer, Eric Baumer, and Ashton Verdery were also recognized for their outstanding accomplishments. On Thursday, March 30, Justice Center Postdoctoral Scholar, Dr. Glenn Sterner, will sit on a panel of experts to hear and evaluate Penn State Abington students’ innovative ideas on how to address the opiate epidemic. These students have worked on this project this semester as part of their CRIMJ 415 course on Drug Control Policy in Comparative Perspective, taught by Dr. Oren Gur, Assistant Professor of Criminal Justice at Penn State Abington. Justice Center Postdoctoral Scholar Glenn Sterner, Ph.D. will speak at the Innovations to Address Opiate Addiction on Tuesday, April 4 from 4:30 p.m. to 6:30 p.m. This event will follow the the 3rd Annual Addiction Symposium where Dr. Sterner will also be speaking. Justice Center Postdoctoral Scholar Glenn Sterner, Ph.D. will present at the Third Annual Penn State Addiction Symposium on Tuesday, April 4, 2017 from 9:00 a.m. to 4:00 p.m. in Junker Auditorium in the Penn State College of Medicine. The title of his talk will be “Corrective Connections: Exploring Network Based Approaches to Alleviating the Opioid Epidemic” and will detail his work with social networks associated with the opioid epidemic. Following this event Dr. Sterner will speak at Innovations to Address Opiate Addiction. Please join us for the upcoming Criminology Forum on Monday, March 13 in 406 Oswald from 12:00pm-1:00pm. Our speaker will be Gary Zajac, Ph.D. The topic of his talk will be "Evaluating the Honest Opportunity Probation with Enforcement Demonstration Field Experiment (HOPE DFE) – Results and Reactions." This presentation will discuss results from the four site Honest Opportunity Probation with Enforcement Demonstration Field Experiment (HOPE DFE) that was conducted by the Penn State Justice Center for Research in collaboration with RTI, International, funded by the National Institute of Justice and the Bureau of Justice Assistance. HOPE is a probation supervision strategy that involves the application of swift, certain and fair sanctioning in response to violations. HOPE had been originated in Hawaii in the mid-2000s and had spread rapidly throughout the U.S. since. Early evaluations of HOPE in Hawaii showed promising results, which have not been sustained in more recent evaluations, such as the current DFE and a similar evaluation conducted in Delaware. This forum will provide an overview of the DFGE results and discuss reactions to the DFE that touch upon the issue of advocacy in science. Dr. Gary Zajac is the Managing Director of the Justice Center for Research at The Pennsylvania State University. He has been Principal Investigator or Co-Investigator on 15 Justice Center projects focusing on courts, corrections, sentencing and policing. His studies at the Center have encompassed racial disparity in capital sentencing, rural criminology, implementation science, inmate social networks, evaluation of domestic relations programs, and specialty courts. His scholarly work has appeared in many journals and books, including Journal of Experimental Criminology, Criminology and Public Policy, Crime & Delinquency, Criminal Justice and Behavior and The Prison Journal. He has advised dozens of state, local and international corrections agencies and organizations on the development of research capacity and the implementation of research-based practice. The Department of Justice, Office of Victims of Crime awarded $1.1 million to the Sexual Assault Forensic Examination and Training (SAFE-T) Center. The project will offer live-examination video conferencing by experts to victims of sexual assault in rural areas. The project is led by Sheridan Miyamoto, assistant professor of nursing, Janice Penrod, professor of nursing, and Lorah Dorn, professor of nursing and pediatrics. The project has many collaborators, including Gary Zajac, Director of the Justice Center. Justice Center Postdoctoral Scholar, Glenn Sterner will be our speaker at the Criminology Forum on Monday, December 5th 12:00pm -1:00pm in 406 Oswald Tower. The topic of his talk will be “Network of Influence: Exploring Criminal Justice Campaign Finance in Montgomery County, PA.” Montgomery County had readily available public data that provided a convenience sample. Post Citizens United, campaign contributions to elected officials in the US are a topic of great debate regarding the functioning of our democracy. The strongest opponents of financial contributions to elected official’s political campaigns allege the ability for individuals and organizations to utilize these contributions as a way to “buy campaigns” or leverage influence on elected officials. Even more insidious is the allegation that contributors aim to influence a network of campaigns, to manipulate a greater section of the democratic system of government. Much of the critiques and analyses regarding campaign contributions are aimed at high profile officials, i.e. US President, US Congress, or Governors. Less attention is given to local officials, especially those within the criminal justice system. This presentation highlights several preliminary findings from a pilot study that utilizes a social network approach to examine the network of campaign contributions to elected criminal justice system officials. Justice Center researchers will present at the 8th Illicit Networks Workshop at The Museum of London on December 7. Dr. Derek Kreager, Justice Center Faculty Affiliate, will present on the Prison Inmate Networks Study (PINS) in a session on Policing, Prisons, and Courts. ‘Network Mechanisms in a Prison-Based Therapeutic Community’- Derek Kreager (Pennsylvania State University), Martin Bouchard (Simon Fraser), George De Leon (New York University), David Schaefer (Arizona State University), Jacob Young (Arizona State University), Dana Haynie (Ohio State University), Michaela Soyer (Hunter College), Gary Zajac (Pennsylvania State University). The current issue of Criminology & Public Policy includes the “Outcome Findings from the HOPE Demonstration Field Experiment,” article. Honest Opportunity Probation with Enforcement (HOPE) is a probation program that involves swift, certain, and consistent sanctions. The team of researchers at the Justice Center for Research in collaboration with RTI, International tested the HOPE probation model in 4 sites across the country looking at the implementation of the program as well as recidivism outcomes. Justice Center Director, Dr. Gary Zajac led the process evaluation component of the HOPE DFE along with Research Assistant Elaine Arsenault, and former Justice Center Director Dr. Doris Layton MacKenzie was a Co-PI on the outcome evaluation phase with RTI. Dr. Rodriguez’ presentation “Strengthening Justice in the U.S.: The Impact of Scientific Research” will emphasize the critical role scientific research plays in strengthening the criminal justice system. She will also discuss how evidence-based knowledge can directly solve challenges faced by hard-working criminal justice practitioners, whether in law enforcement, corrections or the judicial system. Bio: Nancy Rodriguez is the Director of the National Institute of Justice. During 1998‒2015, Dr. Rodriguez was a professor at Arizona State University’s (ASU’s) School of Criminology and Criminal Justice. In 2012‒2014, Dr. Rodriguez served as the Associate Dean for Student Engagement in the College of Public Programs at ASU. Her research interests include inequality (race/ethnicity, class, crime, and justice) and the collateral consequences of imprisonment. Throughout her career, she has engaged in use-inspired research and has been involved in many successful collaborations with law enforcement, courts, and correctional agencies. She is the author of over 50 peer-reviewed publications, book chapters, and technical reports. Dr. Rodriguez received a BA from Sam Houston State University and a PhD from Washington State University. Please join us for a reception with Director Rodriguez from 1 pm - 1:45 pm in 406 Oswald following her talk. Refreshments will be served. This lecture is co-sponsored by the Justice Center for Research, the Department of Sociology and Criminology, and the Population Research Institute. Justice Center Postdoctoral Scholar Glenn Sterner and Faculty Affiliates Shannon Monnat and Ashton Verdery participated in a panel presentation at the Penn State Mini-Conference on Social Networks, Infectious Disease, and Hidden Populations on "Brainstorming Discussion of Methods for Sampling Rural Opiate Users." Summary results of the evaluation of the Honest Opportunity Probation with Enforcement Demonstration Field Experiment (HOPE DFE) available. This project has replicated the original Hawaii HOPE model of swift, certain and fair sanctioning in probation in four states (Arkansas, Massachusetts, Oregon and Texas). Learn more about the project and view the results on our Research Page.